General map of building materials used in European farmhouses; blue is the distribution of log buildings. Log buildings and structures can be categorized as historic and modern. A diverse selection of their forms and styles with examples of architectural elements is discussed in the following articles. Izba - a type of Russian peasant house, often of log construction. The Cabin of Peter the Great is based on an izba. 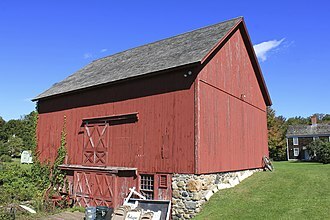 Some barns are log barns such as the earliest of the Pennsylvania barn types. Blockhouse, garrison house - some blockhouse or garrison house structures are tightly fitted timber or stacked plank construction buildings to help withstand an attack. Some granarys (raccard, stabbur, hórreo) are of log or plank construction. Wooden churches in Ukraine - log buildings are the norm south and east of Germany and many of the churches are recognized world heritage sites. Corner post construction sometimes called post-and-plank - this construction method blurs the line between timber framing and log construction with a frame infilled with logs or planks to form the walls. Timber dam - timber crib dams are used to dam rivers. Zakopane Style architecture – inspired by the regional art of Poland’s highland region known as Podhale uses log construction. Hogan - this Native American dwelling evolved to be built of logs. See also, farm buildings and houses in southeast Europe including Switzerland, Austria, Hungary, etc. where log construction is common. Wooden church architecture in Ukraine dates from the beginning of Christianity in the area and comprises a set of unique styles and forms specific to many sub-regions of the country. As a form of culture, construction of the churches in specific styles is passed on to subsequent generations. The architectural styles vary from simple to complicated - involving a high degree of carpentry. Aside from tserkvas, there are quite a few kosciols that are preserved in Western Ukraine, some of these churches remain in active use. Nearly 1,900 wooden churches have been identified in Ukraine as of the end of 2010, when Ukrainians emigrated to the New World in the late 19th century, many used these stylistic forms but adapted their construction to the new materials and new environmental conditions. According to the Director of the Lviv National Art Gallery, Borys Voznytsky, fewer churches burnt down in Western Ukraine during the Soviet era than have burnt down in the post-Soviet period. The wooden church architecture of Central and Eastern Ukraine finds its roots in the first millennium of Christianity in Ukraine from the time of Vladimir the Great, while masonry churches prevailed in urban areas, wooden church architecture continued primarily in Ukrainian villages of central and eastern Ukraine. Unlike western Ukraine, there is no separation of style based on region. Central Ukrainian churches are similar to the multi-chamber masonry churches of Kievan Rus but are, both framed construction and nail-less styles are represented. Деревяні храми України Relatively isolated peasant cultures in western and Transcarpathian Ukraine were able to maintain construction into the early 20th century in wooden styles, many ethnographic regions maintained specific styles of architecture aligned to their cultural and historical differences. The Lviv region alone has 999 churches that are registered monuments of architecture -398 of which are of national importance - however only 16 of those churches have fire-alarm systems. During the post-Soviet era, the Lviv region has already lost some 80 churches to fires, in 2009 the government of the region granted approximately 2 million hryvnias to finance restoration projects of the churches. Bukovina The traditional Bukovinian church features a gabled roof. 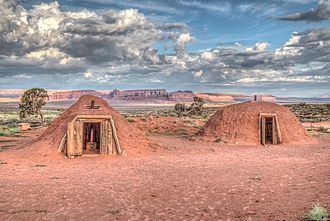 In military science, a blockhouse is a small fortification, usually consisting of one or more rooms with loopholes, allowing its defenders to fire in various directions. It usually refers to a fort in the form of a single building, serving as a defensive strong point against any enemy that does not possess siege equipment or, in modern times. A fortification intended to resist these weapons is more likely to qualify as a fortress or a redoubt, or in modern times, however, a blockhouse may refer to a room within a larger fortification, usually a battery or redoubt. The term blockhouse is of uncertain origin, perhaps related to Middle Dutch blokhus, early blockhouses were designed solely to protect a particular area by the use of artillery, and they had accommodation only for the short-term use of the garrison. The first known example is the Cow Tower, built in 1398, the major period of construction was in the maritime defence programmes of Henry VIII between 1539 and 1545. They were built to protect important maritime approaches such as the Thames Estuary, the Solent, the last blockhouse of this type was Cromwells Castle, built in Scilly in 1651. Blockhouses were a feature in Maltas coastal fortifications built in the 18th century by the Order of St. John. Between 1714 and 1716, dozens of batteries and redoubts were built around the coasts of the Maltese Islands, almost every battery and redoubt had a blockhouse, which served as gun crew accommodation and a place to store munitions. Many of the batteries consisted of a semi-circular or polygonal gun platform, the blockhouses usually had musketry loopholes, and in some cases were linked together by redans. 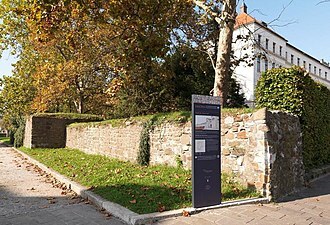 Surviving batteries include Mistra Battery and Ferretti Battery, which both have two blockhouses, and Saint Marys Battery and Saint Anthonys Battery, which have a single blockhouse. Many of the redoubts consisted of a platform with a rectangular blockhouse at the rear. Surviving redoubts with blockhouses include Baħar iċ-Ċagħaq Redoubt and Briconet Redoubt, a few of the redoubts consisted of a single tower-like blockhouse without a platform, and were known as tour-reduits. Of the four tour-reduits that were built, only the Vendôme Tower survives today, originally blockhouses were often constructed as part of a large plan, to block access to vital points in the scheme. 30% of Iceland was forested when it was settled, mostly with birch. Oak was the timber for building Norse halls in Scandinavia. However, Iceland did have an amount of turf that was suitable for construction. 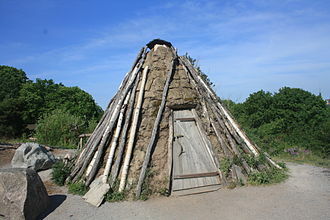 Some structures in Norway had turf roofs, so the notion of using this as a material was not alien to many settlers. 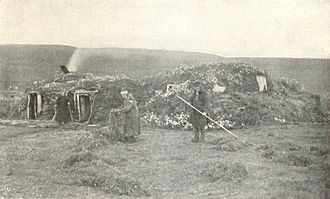 The common Icelandic turf house would have a foundation made of flat stones. The turf would be fitted around the frame in blocks often with a second layer, the only external wood would be the doorway which would often be decorative, the doorway would lead in to the hall which would commonly have a great fire. Another interesting aspect of the Icelandic turf house was the introduction of attached toilets, which were communal, the floor of a turf house could be covered with wood, stone or earth depending on the purpose of the building. They contain grass on their roofs, Icelandic architecture changed in many ways in the more than 1,000 years the turf houses were being constructed. Podhale is Polands southernmost region, sometimes referred to as the Polish highlands. 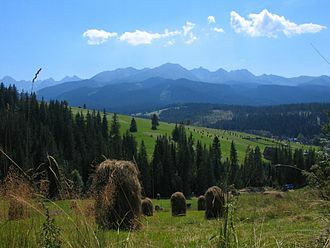 The Podhale is located in the foothills of the Tatra range of the Carpathian mountains, the region is characterized by a rich tradition of folklore that is much romanticized in the Polish patriotic imagination. 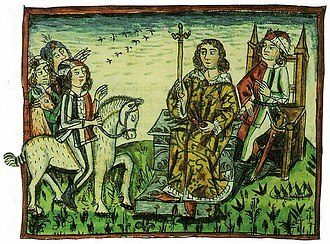 Its folklore was brought mainly by Polish settlers from the Lesser Poland region further north. The name Podhale literally translates as below the mountain glen in English, Podhale is a part of the historical province of Lesser Poland with its capital in the Royal city of Kraków. Among the regions attractions are the mountain resort of Zakopane and the lake known as Morskie Oko. Nowy Targ along the Dunajec River, located in the valley beneath the Gorce Mountains, is the capital of the region, ludzmierz is home to the areas oldest shrine, Our Lady of Ludźmierz known as the Hostess of Podhale or in Polish Gaździna Podhala. The people in region are particularly famous for their oscypek, a cheese made from a mix of cows and sheeps milk, their music. This traditional building method is believed to be the predecessor to half-timber construction widely known by its German name fachwerkbau which has wall infill of wattle and daub, brick, or stone. 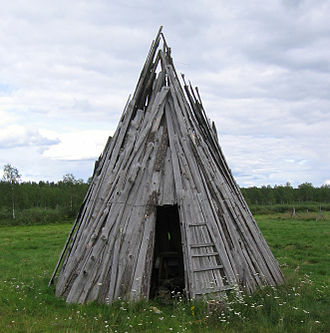 This carpentry was used from parts of Scandinavia to Switzerland to western Russia and this method is not the same as the plank-frame buildings in North America with vertical plank walls. Danish, bulhus Italian, a ritti e panconi “The support of horizontal timbers by corner posts is an old form of construction in Europe and it was apparently carried across much of the continent from Silesia by the Lausitz urnfield culture in the late Bronze Age. The structures found dated from 747-722 B. C and are similar in concept to piece sur piece construction. This historic carpentry is known in southern Sweden, particularly Gotland where it is known as bulhus, Poland, Lithuania, Switzerland. Some researchers believe this method was introduced to the United States by Alpine-Alemannic Germans or Swiss. The Hudsons Bay Company adopted this style for most of its outposts all the way to the Pacific coast. The Upper Lusatian house or Umgebindehaus is a special type of house that combines log house, timber-framing and building stone methods of construction. It is especially common in the running from Silesia through Upper Lusatia and North Bohemia and into Saxon Switzerland. The Upper Lusatian house is defined by the separation of its living area from the roof, or its living area from the upper story. Upper Lusatian houses are transversely divided Middle German houses or Ernhäuser, the hallway runs transversely across the house and separates the ground floor into living and working areas. 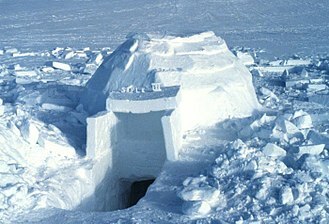 The living area or Blockstube is usually located at the eastern or southern end in order to protect it from damp. The working area, of construction is located opposite the Blockstube. This is where the stalls or stables, store rooms. A building in which the section is replaced by another Blockstube is known as a Doppelstubenhaus. Above the Blockstube the upper storey or roof rests on wooden posts that are stabilised by triangulation with jetty brackets or braces and it is thus independent of the carrying elements below it and may be freely worked on. A box crib or cribbing is a temporary wooden structure used to support heavy objects during construction, vehicle extrication and urban search and rescue. It is commonly used to secure overturned motor vehicles, and debris within collapsed buildings, cribbing is often used in conjunction with other stabilization equipment, such as pneumatic or hydraulic shoring. 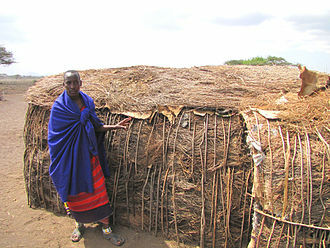 Cribbing is used in mining as a roof support. Cribbing has largely replaced by hydraulic shoring in modern mining applications. Some forms of cribbing can be used on sets and production sites for stabilizing dolly tracks, platforms. Cribbing is usually accomplished with blocks of wood, often 4x4 or 6x6, soft woods, like spruce and pine are often preferred because they crack slowly and make loud noises before completely failing, whereas stiffer woods may fail explosively and without warning. Cribbing may be out of plastic, which unlike wood is not susceptible to rot or corrosion from fluids the cribbing may come in contact with. Cribbing equipment is normally of three varieties, rectangular blocks and step chocks, blocks are the bread and butter of cribbing and will be used in most cribbing evolutions. Shims are used to snug up contact between the crib and supported object or change the direction of the crib, step chocks are often used as a quick solution for stabilizing vehicles on all fours or to quickly increase the height of a crib. Cribbing structures are often categorized by shape, different shapes of cribbing structures are chosen depending on the area available and the point being cribbed to. A box crib is the simplest, most stable and most common method of cribbing and it is constructed by arranging sets of matched blocks in a regular log-cabin style to form a rising square or rectangular frame. The more blocks on level, the greater the number of support points. In trench rescue training materials three basic types of box cribbing are the 4-point, 9-point and full crib, the four point type has two timbers on each level thus four points of contact. Three timbers on each layer makes nine points of contact, the full crib type has each layer filled with timbers. Each point of contact carries a maximum load depending on the size, a triangle or A crib is similar to the box crib, except it resembles a triangular prism instead of rectangular. A parallelogram crib resembles a diamond prism, a tilted tower crib is a box crib in which pairs of shims are used to change the direction of the rising structure, resulting in a curve. Log cabins in the open air Norwegian Museum of Cultural History in Bygdøy, Oslo. A log cabin in the southern Rocky Mountains of Colorado. Ruins of log cabin at Rocky Mountain National Park on Colorado River Trail in Colorado. A timber cutter's mountain log cabin at the Museum of Folk Architecture, Pyrohiv, Ukraine. 17th-century log farmhouse in Heidal, Norway. Timber framed with siding of vertical boards was typical in early New England. Red is a traditional color for paint. Connecticut. The Texas Technological College Dairy Barn in Lubbock, Texas, U.S., was used as a teaching facility until 1967. Russian women using a hand powered winnowing machine in a threshing barn. Note the board across the doorway to prevent grain from spilling out of the barn, this is the origin of the term threshold. Painting from 1894 by Klavdy Lebedev titled the floor or the threshing floor (Гумно). Grange Barn, Coggeshall, England, originally part of the Cistercian monastery of Coggeshall. Dendrochronologically dated from 1237–1269, it was restored in the 1980s by the Coggeshall Grange Barn Trust, Braintree District Council and Essex County Council. Completed in 1750, Fort Edward in Nova Scotia, Canada is the oldest remaining military blockhouse in North America. Ancient Greek geometric art box in the shape of granaries, 850 BC. On display in the Ancient Agora Museum in Athens, housed in the Stoa of Attalos. Leuit, Sundanese traditional granary, in West Java, Indonesia. 19th-century view of village of Trypillia and its wooden church, prior to the damming of the Dnipro river (Regional Archeological Museum). A barn recognized as a cultural heritage monument in Bassum, Germany. Note the wattle-work for ventilation. Reconstruction of building remains found at Biskupin, Poland. from circa 738 B.C. An exterior shot of Villa "Koliba"
Schematic longitudinal section through a Black Forest farmhouse. Key: Sonneneinstrahlung im Sommer = "direction of sun's rays in summer", Sonneneinstrahlung im Winter = "direction of sun's rays in winter", Heuvorräte/Fahrzeuge = "hay stores / vehicles", Schlafräume = "bedrooms", Werkstätten = "workshops", Holzvorräte - "wood stores", Wohnen/Küche = "living area and kitchen", Vieh = "cattle", Keller = "cellar"
Drawings of petroglyphs from the Tagar Culture, 1st millennium BC in Krasnoyarsk Krai, Russia. 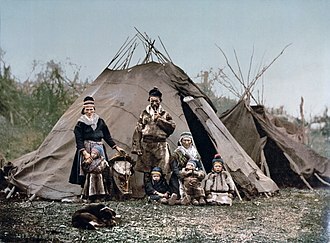 A Sami family in front of goahti. The tent in the background is a lavvu. Note the differences in the pole placement of the two structures. This photo was taken around 1900 in northern Scandinavia. 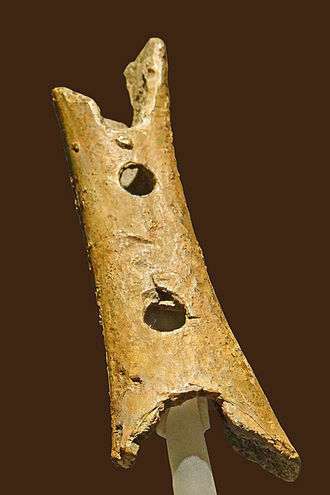 Peat goahti from Eastern Finnmark. Late 19th century. 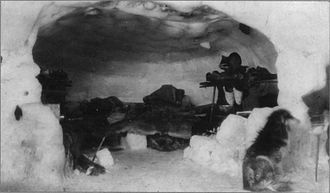 An Inuk inside an igloo, early-20th century. Bailey Island Bridge, Harpswell, ME. The only granite cribstone bridge in the world. The evolution of the hogan as of the 1930s. McIntire Garrison House (1707) in York, Maine, a prototype of the garrison style. The overhang in timber framing is called jettying. Olsen-Hesketh House, Blake Road, Brownfield, ME, a contemporary garrison colonial built 1988-89.